Today I am 30 years old. In honor of this occasion, here are 30 random things about me. 1. I've had a crush on my husband since I was ten years old. 2. My favorite color is grey. 3. I know every word of "Ice, Ice Baby" and cannot forget them for some reason. 4. I have a box full of New Kids On The Block memorabilia. There's even a doll in there. 5. My middle name is Ann. 6. I'm not even 5' tall; I only stand 4'11. 7. I adore John Wayne movies. 8. I met some of my dearest friends on the Internet. Meeting them is one of my most treasured memories. 9. I have a framed photocopy of a stuffed pink monkey's behind. That sounds weird, huh? 10. For some reason I hum the theme to Love Story when I wash dishes. 11. Hank on King of the Hill could be my Dad. Seriously. 12. Liver and onions is one of my favorite foods. 13. I love Joe Walsh! His guitar playing makes me teary eyed. 14. I am a blog addict! I'll sit down to check my blog roll for new posts, then completely lose track of time. I've made some great pals, tried some great recipes, and learned soooo much from the blogsphere. 15. I am finding this really difficult. 16. I really like being an aunt. Next to being a mama, it is the most awesome thing! 17. I am awful at gift wrapping. 18. I love old, vintage, unique stuff. My style is very eclectic. 19. I also really enjoy western things. Cowboys rock! 20. Classic country music calms me. When stressed, I turn to Willie Nelson, Merle Haggard, Johnny Cash, or George Jones. 21. I love the smell of Stetson cologne. 22. My children's laughter is my favorite sound. 24. I love writing letters and believe it is becoming a thing of the past. This makes me sad. After all, who doesn't enjoy receiving a letter? 25. I have a serious crush on Hugh Laurie. 26. I love TV shows that I'm too embarrassed to admit that I watch. 27. Have I mentioned how scatter brained I am? I am awful about flitting from one unfinished thing to the next. 28. I am fiercely frugal and proud of it! The idea of paying full price for stuff makes me kinda queasy. This has been a problem since moving to Podunk, but I still try my hardest to find great deals. 29. I still have stuffed animals on my bed. Sometimes they even sleep with us. 30. Writing this blog has been one of the most amazing experiences. I've met folks I hope to keep in touch with for years. Your comments really mean a lot to me. Thank you all for reading me. LOL Have not heard Freak Out in a long time. You have such a sweet sounding personality. I enjoyed your list! Hope your birthday...and Christmas are just wonderful! Happy birthday Youngster!! We have numbers 12, 22, 23, 24, and 26 in common! Hahaha#9, YEP that sounds really weird. Happy Birthday and merry Christmas my blogging friend! I hope you have had a wonderful two days and I really enjoyed your list! 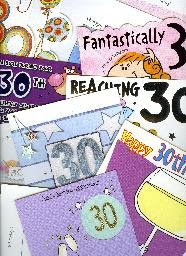 how sweet to be 30- hope you have a wonderful year. Happy Birthday a few days late. I enjoyed reading your random list. Happy Happy Birthday!!! We almost share a birthday!!! I turn 30 tomorrow! Hope your year is an awesome one!! !